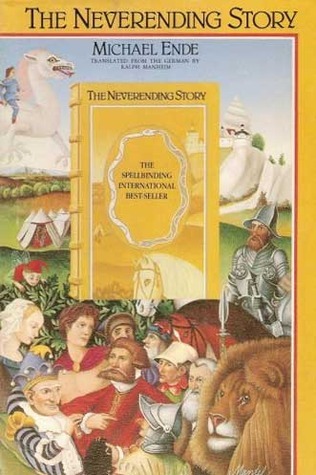 The Neverending Story is a book that has been on my radar for a long time, but that I never really wanted to read. One major reason is that I didn't like the film, which I only saw as an adult, when it was shown on my college campus for Founder's Day one year. The other reason is that it was read aloud to me and my classmates on my first overnight class trip in fifth grade, on my very first night away from home, just after I was told that, contrary to what I had been promised on the bus, I would not be allowed to call my parents. For a long time, I have had a vague sense of this book as creepy and unsettling, probably only because the situation in which I first encountered it was so uncomfortable. In any case, reading Momo last year changed my opinion of Michael Ende for the better, and I decided to give this, his most well-known book, another chance. I was definitely not disappointed. The Neverending Story begins in a book shop, where Bastian Balthazar Bux, an average boy who has recently lost his mother, feels a mysterious book calling to him. Playing hooky in the attic of his school, Bastian begins to read the story, becoming more and more engrossed in the fictitious world of Fantastica as the hours tick by. It becomes clear, as the story goes on, that characters in the story - namely a boy named Atreyu, and Fantastica's leader, the Childlike Empress - can see Bastian, and that they need him to come into the story and help save Fantastica. At first Bastian does not see himself as a hero, but after he is eventually convinced to enter the book, his self image begins to change until he nearly loses his identity altogether. As the reader watches Bastian gain his heart's desire, she also worries that he may never be himself again. One of the many great things about this book is that the text is printed in two different colors: red for the events of the real world, and green for happenings in Fantastica. This is an excellent way of portraying Bastian's gradual entry into Fantastica, and also very helpful to a reader like me, who always feels slightly out of her element in a fantasy novel. Following Bastian slowly into Fantastica, and knowing the exact moment that he crosses from the real world into the fantasy world made me like this book a lot more than I might have otherwise. I also love that this book speaks intelligently to young readers (and adult ones, too) about the importance of imagination and the dangers of wishing and wish fulfillment. Anyone who reads this book can come away from it with something new to think about or discuss, and there is enough depth that a re-reading of the story could only enrich that experience further. There are enough unusual characters and strange events to keep the regular fantasy reader engaged, but there are also many layers that can appeal to very academic-minded readers as well. Overall, I would recommend this book to readers ages 10 and up, and I would definitely urge kids to read it before they ever see the films!